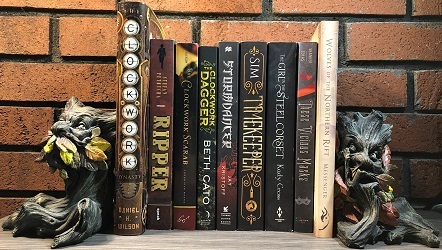 We are heading into the fourth month of the Parasolverse Read-Along. The book for November is Manners & Mutiny Book 4 of the Finishing School Series. If you are still interested in joining along please do so! If one must flirt…flirt with danger. Lessons in the art of espionage aboard Mademoiselle Geraldine’s floating dirigible have become tedious without Sophronia’s sootie Soap nearby. She would rather thwart dastardly Picklemen, yet her concerns about their wicked intentions are ignored. Who can she trust? Royal werewolf dewan? Stylish vampire Lord Akeldama? Only one thing is certain: a large-scale plot is underway. Sophronia must be ready to save her friends, her school, and all of London from disaster. Hmmm… I wonder if I’ll have time to catch up on the 2 that I missed and join in?? I’ll have to see what I can do!! If not pick back up in December!